In this review, we will take an in-depth look at two popular mattress brands – the American-made Casper and the Canadian manufactured Endy. The mattresses come in at similar prices – their foam based layer designs have made them leaders in their market segment. Endy has grown to be Canada’s most popular online mattress provider. They offer their customers a range of different benefits which have made them exceedingly successful in the industry. If you purchase a mattress through Endy’s website, you’ll receive a 100-night trial, a 10-year warranty, and free shipping directly to your home. The Endy flagship mattress is composed of three separate layers – the mattress is 10” thick. 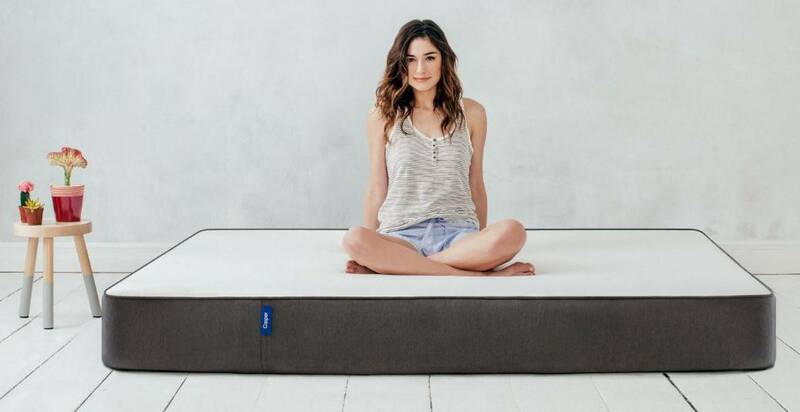 Endy has done a wonderful job of using three separate foam compositions to develop an exceedingly comfortable mattress – it has put many foam mattress critics to rest. This is the layer the consumer comes into contact with the most – for this reason, the primary function of the top layer is comfort. The top layer is produced from memory foam, much similar to that of a Tempurpedic mattress. The entire top layer is 2” thick – providing ample comfort to those sleeping on it. The middle layer is 3” thick – it has been manufactured to provide a transition between the top and bottom layer. It prioritizes both support and comfort. As with the top layer, the middle layer manufactured from foam – although it is not memory foam. As with most mattresses, the bottom layer of the Endy mattress prioritizes support above all else. It does a brilliant job of allowing the rest of the mattress to be designed for comfort. The foam used to construct this portion of the mattress is extremely dense – it is also 5” thick. The three layers in the Endy mattress combine beautifully to provide a comfortable mattress that also has ample support for the owner. The cover of the Endy mattress is manufactured using polyester fabric. The thickness of the fabric adds to the size and comfort of the mattress. One of the major drawcards of the Endy mattress cover is its durability. The sides of the mattress cover are built to last, while the top of the cover is quilted – this is done in order to ensure maximum comfort. 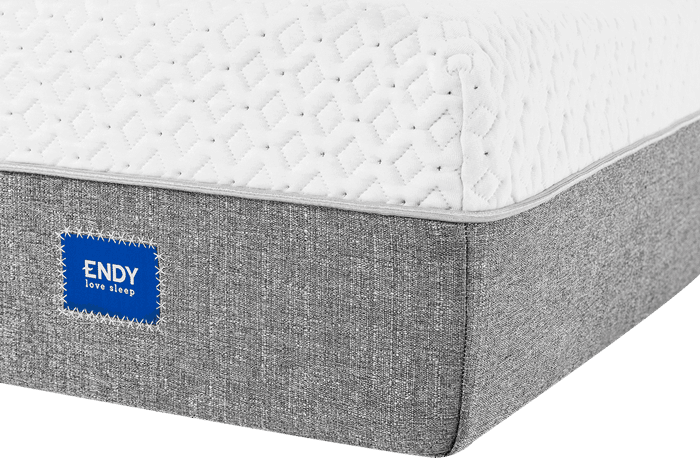 The quilted cover top has helped differentiate the Endy mattress from its competitors, including the Casper mattress, whom don’t have similar comfort focused cover tops. Another great advantage associated with the Endy cover is the ability to remove it for cleaning. While you won’t be able to machine wash the cover, the added benefit of removal for cleaning is a feature not present in many other mattress models. The Endy is well known for being one of the most supportive mattresses on the market – it has an extremely firm base. In comparison to other mattress models, the Endy scores in the 30% for firmness. While the top layer of the mattress is constructed from memory foam, the firm base of the mattress creates a sturdy support system that prevents the owner from lying deep in the mattress. This type of mattress design is not for everyone – many light sleepers report feeling as though they are too on top of the mattress. Regardless, the Endy mattress is one of the best mattress models on the market for alleviating heat. If you often feel as though you get too hot at night, the Endy mattress may be the perfect choice for your home. In terms of overall comfort, the Endy mattress will vary in preference amongst different people. If you are on the heavier side, and you like a firm, supportive mattress, the Endy is one of the best available options on the market. Those who weigh considerably less may find that the firmness of mattress provides unwanted pressure on certain parts of the body – this appears to be especially true for the neck. All of this will depend greatly on the way that you sleep and the type of body you have. If you want a foam mattress that has significant support, you can’t go wrong with the Endy. You’ll just want to make sure that you aren’t too light of a sleeper to take advantage of the firmness in the mattress. One of the components that Endy has addressed well is the edge support. Many foam mattresses struggle to provide ample edge support for sleepers – this creates a range of problems, including the feeling that you may roll off the mattress in the middle of the night. The Endy has tackled this problem head on, you won’t feel as though you’re unstable on the mattress whatsoever. In addition, Endy’s foam design allows for a reduction in motion transfer. This means that if you are a restless sleeper, your partner won’t be disturbed by your movements in the middle of the night. This is one of the major benefits of buying a high-end foam mattress, traditional spring mattresses tend to have a large degree of motion transfer which can impact the sleep of those who have restless partners. Endy does a great job of making their mattresses available at competitive prices. In addition, because there is free shipping included in any order, there are no added charges or fees that you need to account for when deciding on whether or not to buy an Endy. As a company, Endy also offer in-house financing solutions which can allow you to purchase the mattress using installments. Casper has grown into one of the premiere online mattress manufacturers in the United States. Casper mattresses are constantly changing – the firm has put considerable effort into ensuring that they’re always ahead of the curve. If you want a mattress that is committed to having as many modern features as possible, Casper should be one of your first ports of call. Casper is a customer favorite, they have a considerably good feedback on multiple consumer watchdog sites. In addition, they offer their customers free shipping with any mattress order – you can even order through Amazon, Prime Members are entitled to their usual two-day free shipping benefit. As with the Endy mattress, you’re provided with a 10-year warranty and a 100-day trial period. Now let’s take a look at how these two mattresses compare with one another. The top layer of the mattress is a thin, 1.5” poly foam. As with many top layers in foam mattresses, the poly foam layer is in place to provide comfort for those sleeping on the mattress. In the case of the Casper mattress, the layer provides a cooling effect which allows the sleeper to get a much more pleasant sleep. The second layer of the Casper mattress is also 1.5” – this layer is manufactured from memory foam. This provides additional comfort for those sleeping on it, but is protected from heat by the top layer. Many memory foam mattresses can retain too much heat – the Casper design does a great job at preventing this. The third layer is the same as the top in terms of thickness and material. It is considered a hybrid layer that allows for extra comfort prior to the beginning of the support layer. The bottom layer is in place to provide as much support as possible to the rest of the mattress. It is a 5” thick and made from a durable, thick poly foam. Casper is a truly innovative company when it comes to mattress design. They have been industry leaders in providing a mattress that makes use of a range of different materials and layers. Their four-foam design allows their mattresses to benefit from a variety of materials. The design does a great job of retaining a base amount of heat without making the entire mattress too hot. In addition, it provides ample support while still providing the benefits of memory foam. The Casper mattress utilizes a thin cover that allows for the traits of the mattress to be felt directly by the owner. This is done intentionally – Casper know their mattress provide a great texture and that an overly thick cover would dilute the benefits of their foam design. While it is thin, it is also soft and surprisingly durable. You can stretch the cover significantly without damaging the viability of it. The cover isn’t composed of a single fabric – the top of the cover is manufactured from polyester exclusively, while the sides are a mix of polyester and polypropylene. The sides of the cover are much more durable than the top, which provides additional edge support and helps maintain the shape of the mattress. If you’re looking for a cool mattress, the Casper is one of your best options – the thin cover design ensures that breathability is never sacrificed. The Casper mattress has been built to appeal to a wide variety of customers. The manufacturers have decided against committing to a radical feel in order to ensure a wide appeal. The design of the mattress doesn’t tend to be extreme in any direction, meaning that no matter what your preferences, there are certain to be things you like about this mattress. In terms of firmness, the mattress is in the top 40% of its category. While the mattress does supply ample support to those sleeping on it, it isn’t the firmest mattress on the market. If you are heavy, you may find it difficult to get the support you need from the Casper mattress. We recommend that you look into the Endy mattress – there is a much more supportive base layer present in this mattress. The Casper mattresses extensive comfort layers mean that heavy sleepers may dip hard into the mattress and feel the support layer directly on their bodies. Regardless, the mattress exhibits great motion control which will prevent you from disturbing your partner in the middle of the night. Like the Endy mattress, the Casper mattress is great for those who may have a restless sleeping partner who moves frequently throughout the night. After reading the information on this page, you should have a pretty good idea which mattress might be right for you. The Casper and Endy come in at similar price points, although if price is a major concern, the Endy is fairly cheaper. 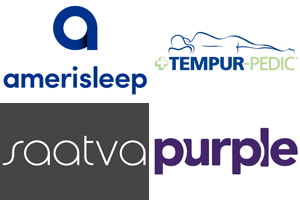 In terms of quality, both mattresses are produced by top performing companies that have invested heavily in creating top-of-the-line foam mattresses. If you’re a heavier person, you probably want to opt for the Endy – it has great mattress support and edge support. Lighter sleepers may feel as though they are sleeping on top of the Endy, which can be quite an awkward feeling. For those who are light and looking for a cool, breathable mattress, the Casper is one of the best choices on the market. The four-layer system has done a great job of providing a comfortable sleeping experience without the additional heat.